TCC is proud to once again sponsor Muirfield Village’s first official Pelotonia Team! TCC member and longtime Muirfield Village resident Dale Darnell, along with support from the Club and Village Living, will lead this year’s team in its goal to help END CANCER. In its second year, the team will honor late TCC member Peggy Buckles and current member and surviving warrior Gene Alfonsi. Team Muirfield Village will host its second annual celebrity golf outing on Monday, July 9 at TCC. The outing will feature celebrities such as Archie Griffin, Butch Reynolds, Craig Krenzel, Tom Cousineau, Mike Doss and more! Each group will consist of one celebrity and three golfers (to create a foursome), so each participant will have the opportunity to play with a featured celebrity. A variety of sponsorship opportunities are available for the outing. Advertise your business to the celebrities and event participants and help us reach our fundraising goal! Click here to register or to view event details, or contact Dale at [email protected] or 614-980-3601 for sponsorship opportunities. To further its fundraising efforts, Team Muirfield Village will host a wine tasting event at TCC on Tuesday, June 19 from 6–9 p.m. The evening will include several excellent wines as well as delicious hors d’oeuvres prepared by Chef Gabriel. We will also have raffle opportunities (50/50) to win money, wine and other special gifts. 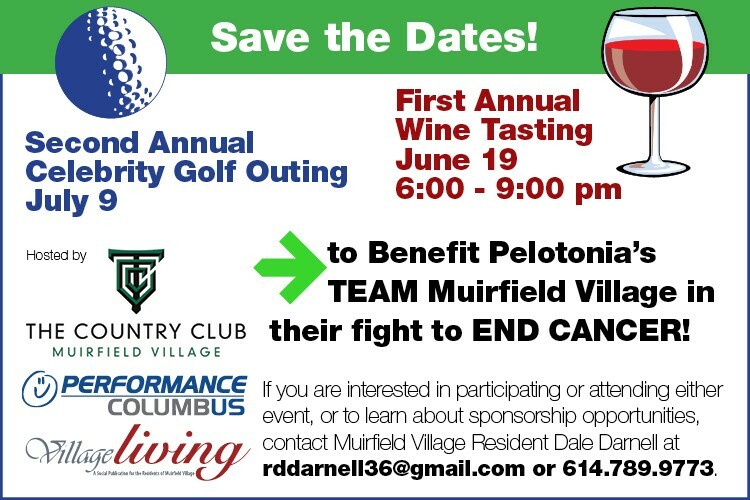 All proceeds earned from the golf outing and wine tasting will directly benefit Pelotonia and life-saving cancer research at The James Cancer Hospital and Solove Research Institute at The Ohio State University. Team Muirfield Village invites you to join its team for Pelotonia's 3-day cycling event in August. Support the team by becoming a rider, volunteer or fundraiser. Click here to learn more about the event or contact Dale at [email protected] or 614-980-3601 for more information. We invite you to share this information with your friends, family members, neighbors and co-workers. There's no better way to support a great cause than supporting it together! In 2008, Pelotonia was established with the objective to fund life-saving cancer research. In its nine years, Pelotonia has raised more than $155 million for cancer research. Thanks to its generous funding partners, Pelotonia is able to direct 100 percent of every dollar raised by its participants to cancer research at The Ohio State University Comprehensive Cancer Center –James Cancer Hospital and Richard J. Solove Research Institute.